You may or may not have heard of the Farmacy Beauty brand by now but it's definitely one to watch for it's innovative farm to table approach to skincare and good, clean ingredients. I've become a big fan since trying a number of their products. The latest is this Honey Potion Mask. Honey happens to have many wonderful benefits both for the body and the skin. Since I've concocted many DIY facial masks with honey, I was really curious to see how this mask would perform. 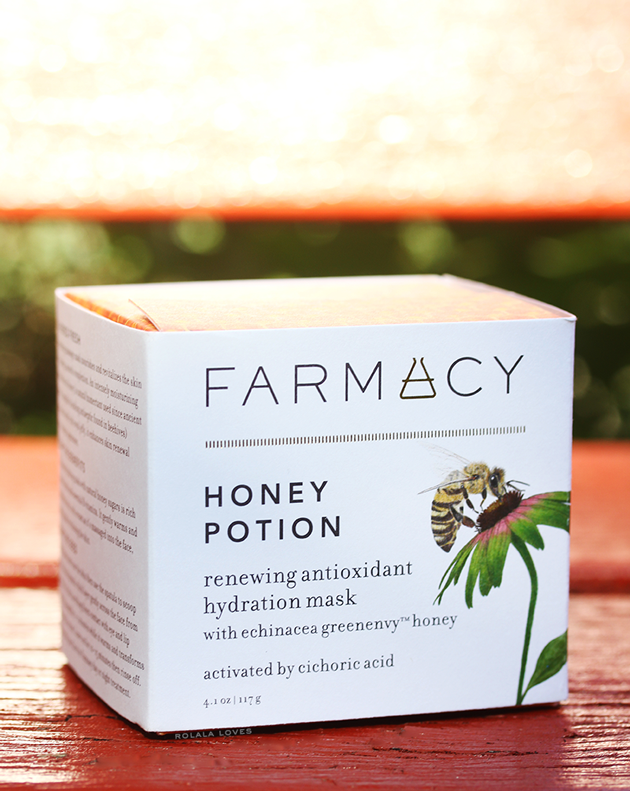 Product Claims: Farmacy Honey Potion Renewing Antioxidant Hydration Mask is the first in Farmacy Beauty’s debut line of honey products, Honey Potion is an innovative warming massage mask that nourishes and revitalizes the skin for a glowing, smooth complexion. Key Ingredients: As with all other products in the Farmacy beauty range, this mask is formulated with naturally derived ingredients and features Echinacea GreenEnvy, a unique, patent-protected variant of echinacea purpurea that contains the highest known concentration of cichoric acid, which helps protect the skin. 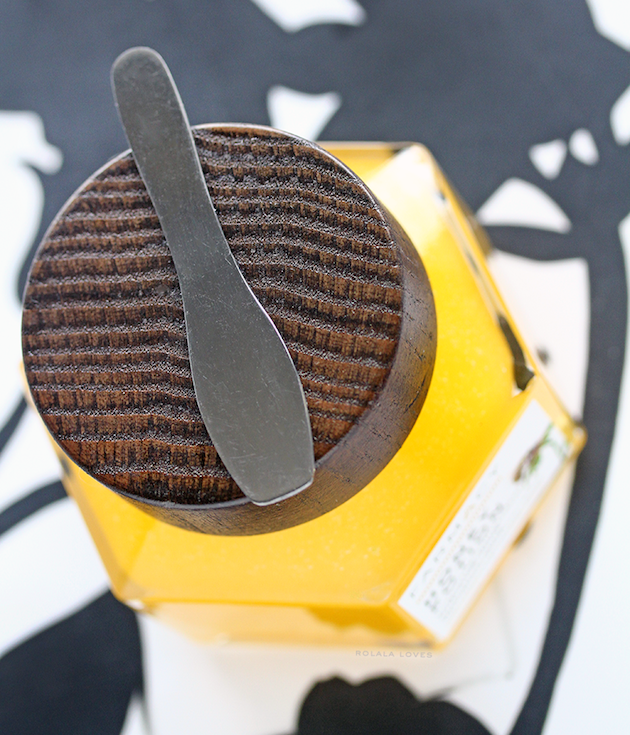 Honey from the bees that live on Farmacy’s farm; is a natural humectant. Propolis is known for it's intense healing and antibacterial properties. Royal Jelly which is rich in amino acids, enhances skin renewal for a more youthful appearance. Essential B vitamins work to smooth and renew dry skin. Ginger root extract helps to soothe skin. Glycerin attracts moisture and provides hydrating effects for a moist, supple skin surface. Packaging: A heavyweight hexagonal glass jar with a wooden screw off top. A metallic spatula is included to dispense the product. The cap is magnetized so the spatula adheres to it when not in use which is fantastic for keeping track of it. How to Use: After cleansing and and toning, use the spatula to scoop the mask and spread a thick layer gently across the face from forehead to chin (avoiding direct contact with eye and lip areas). Massage around face for one to two minutes while it warms and transforms into a white cream. Leave on for 10 to 15 minutes then rinse off. Follow with your skincare routine. My Impressions: This mask has a thick honey-like texture and a subtle scent that's also reminiscent of honey. The spatula makes it easy to get the product out hygienically. The mask feels sticky upon contact and as you spread it around your face, it turns into a white cream. Following the instructions, I massaged it onto my face for about a minute and half each time I used it which releases a warming sensation all around. if you've ever used any type of warming mask before, it's the same type type of feeling and it does last for the duration as you have it on your face. It does slightly tingle initially but that goes away and this wasn't something that bothered me but I wanted to mention it just in case it's a concern for others. The mask easily rinses clean off without leaving behind any traces or residue. My skin felt clean and soothed afterwards. I didn't see any remarkable results the first time I used it but my face felt great afterwards and the next morning. The second time I used it was a day after doing a home microdermabrasion treatment with a device. I was probably a little overzealous since it was the first time I tried this and was with left a small red vacuum mark on my cheek. Following this mask, the red mark was barely visible and needless to say I was sold on this product. This alone was impressive but I also like how it leaves my skin feeling smooth and renewed whenever I use it. I think this will be especially good during the colder months. I'm not usually a big fan of glass jars because I'm afraid of shattering them but I'm partial to this one since it's both eco-friendly and luxe. I already have plans to re-use it after I'm finished with this mask. Check out my other Farmacy product reviews. 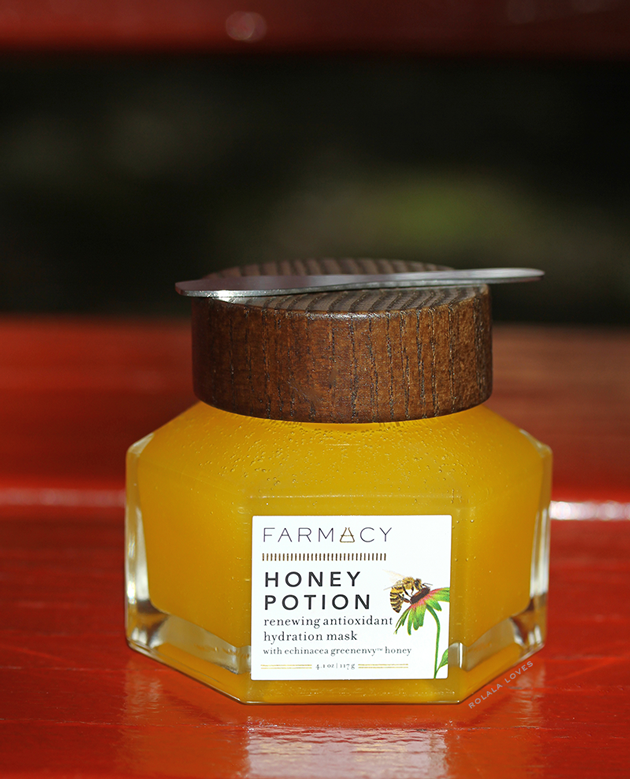 Honey Potion Renewing Antioxidant Hydration Mask can be purchased direct from Farmacy Beauty and it is also available at Sephora. Farmacy donates $1 for every jar of Honey Potion sold to City Growers, a nonprofit that engages city kids in active learning about where food comes from — including the importance of bees, pollination and the production of honey. What do you think of this product? 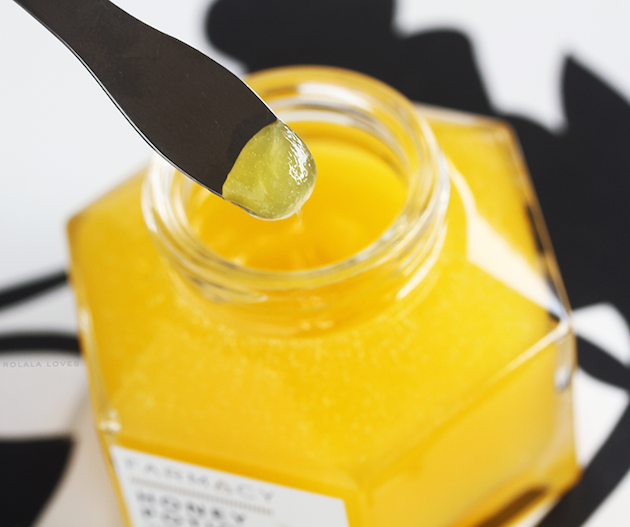 Do you use any honey products in your beauty routine? OMG this is product <3 I have to try Rowena. Lovely packaging, I would like to try it! I love how Farmacy is able to pull off such contemporary yet eco-friendly concept on their packaging. I think glass is the best possible material that can keep the ingredients "fresh". Love the packaging and how thick it is definitely a product I will love to try. Enjoy your weekend. Seems amazing, would love to try it! LOVE the whole honey jar concept :-) It really looks edible. I'm generally a fan of honey-based skincare because it always seems to help with my acne. love this brand, love honey, and i know i'd love this! I have heard about the brand, but have yet to try their products. The mask sounds pretty good, Rowena. I'll be posting my review on this next week! I agree that I didn't see any differences to my skin initially but now that I've used it for a few weeks, my skin is definitely looking better. Honey does have many health benefits and I do remember using DIY honey masks on my face. I have to remember to do so again. I haven't heard about this brand before, but it is good to know you have had a good experience with their products so far. This honey potion seems great! Nice to know that this honey based face mask worked well on your skin...and that it even removed that red spot from your face. It does seem like a lovely face mask and I like that it smells like honey too:). This sounds like a very delicious mask, haha. The packaging is absolutely lovely, and I am glad that it works for you, Rowena. I can see why you will re-use this product again. I personally have never used this type of masks (I don't use masks in general), but if I have this one at home, I would be happy. Enjoy the weekend! I love the packaging it truly looks edible. Ahhh this looks so great! I seriously love honey anything for skin! it is useful thing for every disease. How cool that the mask turns white! I have occasionally used products that include honey; mainly shampoos. Have a great weekend. It looks good enough to eat in that jar, and the ingredients sound great as well. Thanks for this great review Rowena. I love the color and the textures appears nice too. It honestly looks good enough to eat and the ingredients sound great. I'm loving it. Ooo this sounds good but makes a bit cautious as any time I use Burts Bees products I have an allergic reaction makes me wonder if there is something in the honey etc, could be pollen which I am allergic to. But for those w/o allergies I say go for it! I used raw honey on my face. This one sounds amazing. I've been really loving the benefits of honey and have been thinking about using it more in may skincare. This mask sounds great, especially after reading how it soothed your irritated skin. Thanks for the review! I think I want to try it Rowena for it's hydration properties! I'm a little scared of the warming effect HAHAHAHA but it sounds so worth it afterwards. I was suppose to get into Farmacy products this year, but I haven't had the time. All of their products sound so good. I loved the samples you sent me. I've been using this mask for the last month and skin absolutely loves it. My skin is definitely softer and full of life.